Unfortunately one of the only downsides to living in Australia other than the public transport (or lack thereof!) is metred internet connections: coming from Singapore where the internet is fast, cheap, reliable and unmetred this is quite a shock. 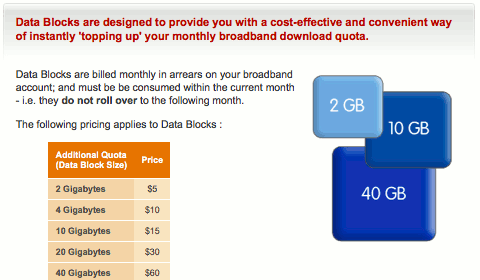 All Australian home broadband internet plans come with a ridiculously low specified download quota, after which your connection is throttled or disabled. The justifications for download quotas are as dubious as the system itself, but that’s for another post… and believe me it’s coming! I feel I should give credit though where credit is due and applaud Adelaide’s very own Internode for their service. We were approaching our download quota we were able to login to the Internode site and buy an additional data block which went live within 90 minutes. As with all our Internode bills and payments I received an email invoice and all was taken care of. No fuss. Thank-you for ordering an Internode Broadband Data Block! You have ordered a 10 Gbyte data block, at a cost of $15.00 for the account […]. This charge will appear on your next invoice. Note that it may take up to 90 minutes for this Data Block to take effect in our systems. This includes newly purchased Data Blocks being shown in online tools and 3rd party usage metering and for bandwidth shaping (if applicable) to be removed. I can’t recommend Internode highly enough if you live in Australia… even if they do cap your downloads (everyone else here does too). They’re quick, no nonsense, helpful and they just… work! Newer post ← Clipmark: Joe the Plumber a political William Hung?